The increasing number of dengue cases in this town prompted the Provincial Health Office (PHO) to declare code white alert status. Under this status, government hospitals are directed to ensure the immediate treatment of patients, especially those in emergency situations. Emergency personnel are also placed on call status for speedy mobilization. In response to the declaration of code white status, Vice Governor Jose "Bong" Teves, Jr., conferred with EBMC officials, including Dr. Alcantara, OIC Chief; Dr. Elmer Tatad, Dr. Aly Romano, and members of financial team of the provincial hospital to inquire on how his office can help. Teves, after the meeting, committed to extend P1,500 of financial assistance per dengue patient confined at the EBMC, the Immaculate Heart of Mary Hospital and the Dr. A.P. Zantua Memorial Hospital, as part of his Social Service Program on Health. 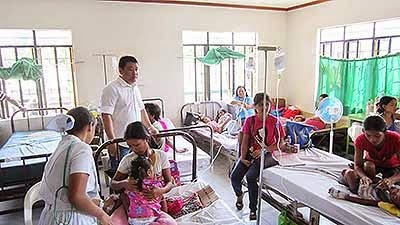 He announced that P100,000 will soon be released to the financially handicapped or indigent patients of the EBMC to aid in the purchase of medicines that are not available at the hospital pharmacy.